The bell tolls for Stephen Drew it seems. Everyone is signing and he has yet to be in the news as a valid option for the Red Sox to resign. 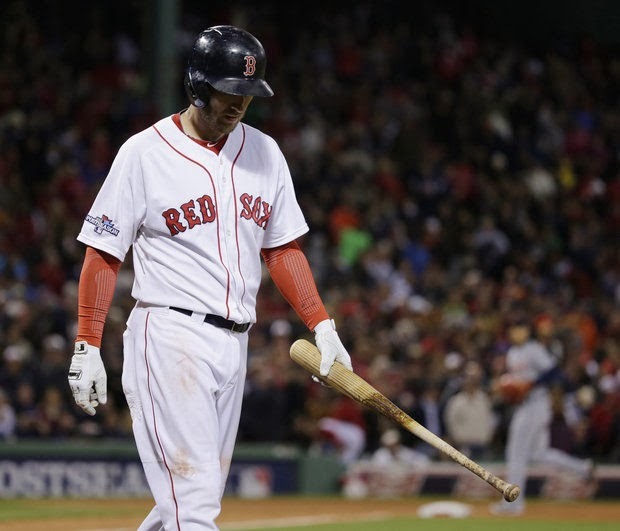 Why would the Red Sox not want to resign Stephen Drew? This last week the Red Sox signed Mike Napoli to a two-year, $32 million dollar deal, added catcher A.J. Pierzynski in a one-year, $8.25 million dollar deal, and inked reliever Edward Mujica to a two-year, $9.5 million dollar contract. What did this mean for Stephen Drew, well... not much good I am afraid. As Alex Speier at Full Count tells us, the Red Sox are nearly at the top of their budget in terms of payroll commitments if they want to stay below next season's luxury tax threshold of $189 million dollars. Last weeks signings leaves them just a tad over $187 million on payroll, with a small cushion for injuries and backup bullpen purchases if needed later in the season. With the luxury tax looming the chances just got smaller that he will be resigned. The Red Sox are not likely to fund nor fill the desire of Stephen Drew to ink a multi-year deal. Back in November, Gordon Edes from ESPNBoston talked about how he will be getting interest from many teams that will be willing to offer him multi-year deals. He has been linked to interest by the Yankees, who don't give a hoot about luxury taxes, and others such as the Mets. Last year he made $9 million on a single year deal and rejected his $14.1 million dollar qualifying offer to sign for 2014. With Scott Boras at the helm of his future, chances are good this ship is sailing off into the crazy waters of multi-year, multi-digit millions contracts somewhere outside of Boston. The Red Sox would like to have a bit more back up with regards to a good bat on the left side of the infield, but right now they have plenty of defense with Will Middlebrooks and Xander Bogaerts. There is really no need for the Red Sox to offer nor pay for a multi-year deal with Stephen Drew. Not being in a big rush with this signing means that Ben Cherington is sitting on a player the turned down a qualifying offer. If he happens to leave, then they end up with a very good draft pick in return. No reason not to wait this out a bit and see if they can't maybe get him back for a whole lot less years and dollars than he is currently fishing for. Do you think Stephen Drew is a Red Sox necessity this week in the winter meetings?